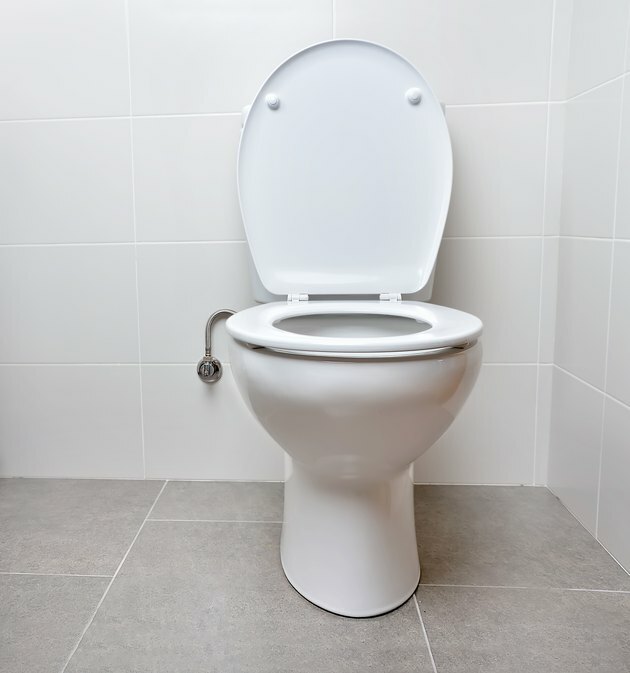 A toilet is a plumbing fixture, and like many fixtures, it usually has its own shutoff valve on its water supply pipe. This valve is installed for the very reason you need one now: providing a convenient means for shutting off the water when you need to repair or replace your toilet. To see if your toilet has a shutoff valve, follow the water tubing down from the bottom of the toilet tank. This tubing is usually found on the left-hand side of the tank (as you face the wall), and it is connected at the top to the tailpiece of the toilet's ballcock. If you follow this tube downward, you will usually find that it connects to a shutoff valve near the wall (or possibly the floor) behind the toilet. If you can't find a shutoff valve, don't worry; you can shut off the water to the entire house, including the toilet. Even if you have a shutoff at the toilet, you may need to use the house's main shutoff if the fixture shutoff gives you problems. The toilet shutoff valve is usually located on the wall or floor behind the toilet. Fixture shutoff valve and supply tubing. 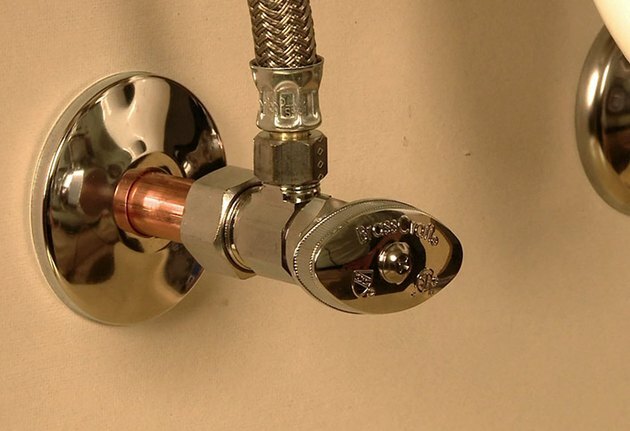 To close a valve with a football-shaped handle, turn the handle clockwise until the handle stops. This may take several rotations of the handle. To close a valve with a lever handle, turn the lever one quarter turn clockwise until the handle is perpendicular to the water pipe. Fixture shutoffs don't get used often, and they can stick or fail to close completely when they finally do get used. 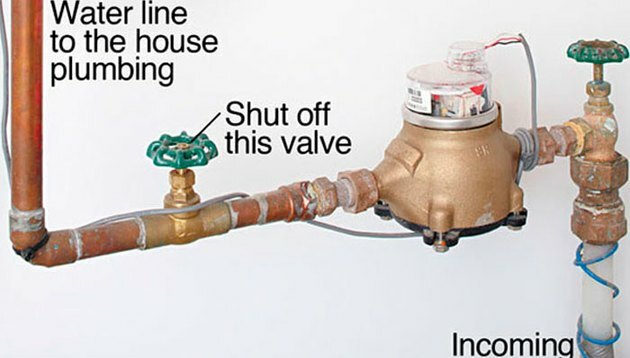 If you closed your shutoff valve all the way but the water is still running, follow the steps below to shut off the water to the house. You should replace the fixture valve while the water is off to the house, because old worn valves may prone to leaking. If you have a basement or crawlspace, it's probably located down there, near the wall or a corner closest to the street. Look for a large—usually 1-inch—pipe coming through the wall or up through the ground. The first valve along the pipe is most likely the main shutoff. If there is a meter on the pipe, use the shutoff valve on the house-side of the meter. If you don't have a basement or crawlspace, your main shutoff may be in the garage or near your water heater (but it's not the valve on the cold-water pipe going into the water heater). Some homes in warm climates have shutoffs on the outside of the house, near an exterior wall and usually hear a hose bib (outdoor faucet). Main water supply line with shutoff valve. To close the main shutoff valve, turn the valve lever clockwise one-quarter turn, until the handle is perpendicular to the water pipe. If the valve has a round handle, turn it clockwise until it stops. Once you've shut off the water, open the hot and cold water taps on a faucet in the lowest level of the house, to relieve pressure in the water system. Can’t Find the Main Water Shutoff? You can always shut off the water at the meter, inside the ground box near the street. 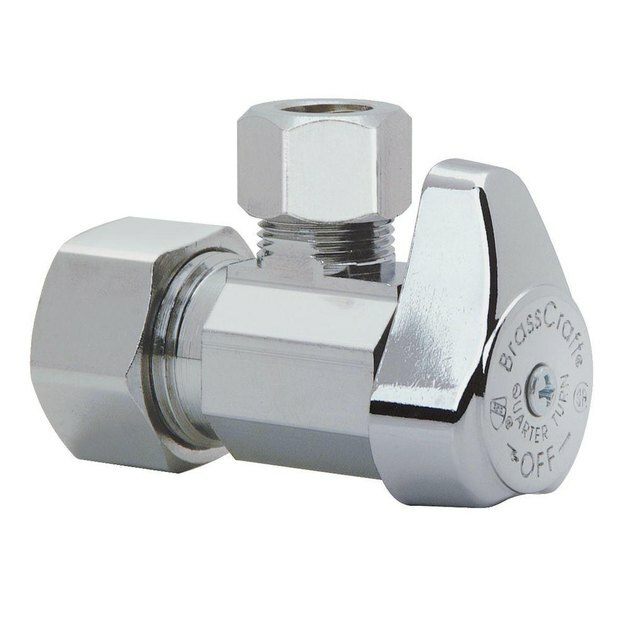 The valve is on the house-side of the meter and usually is a quarter-turn valve that you operate either by hand or with a meter wrench or an adjustable wrench. Turn the valve clockwise until the valve handle is perpendicular to the pipe. 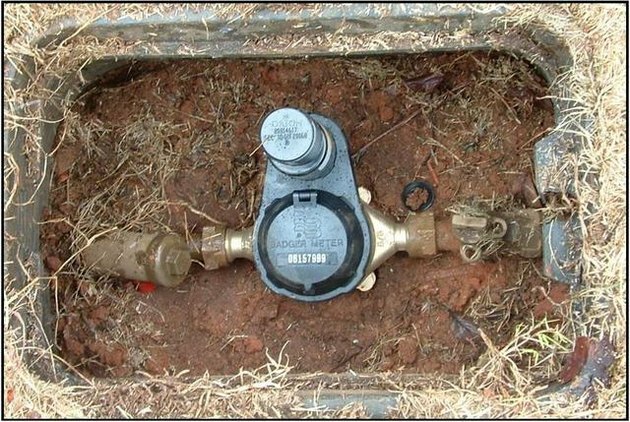 Water meter in ground box; the shutoff valve is to the right of the meter.